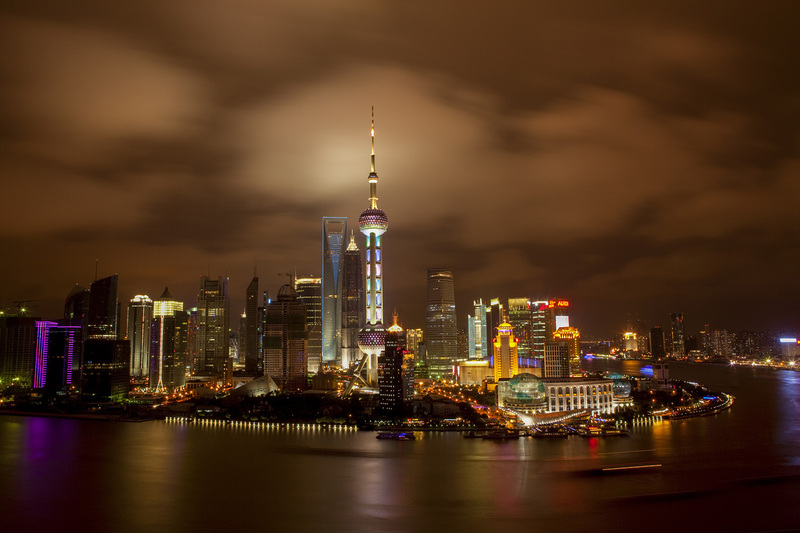 Images of Shanghai’s Pudong New Area skyline have been used often in both Chinese and western media as a symbol to illustrate stories about China’s economy, projecting an image of modern China. 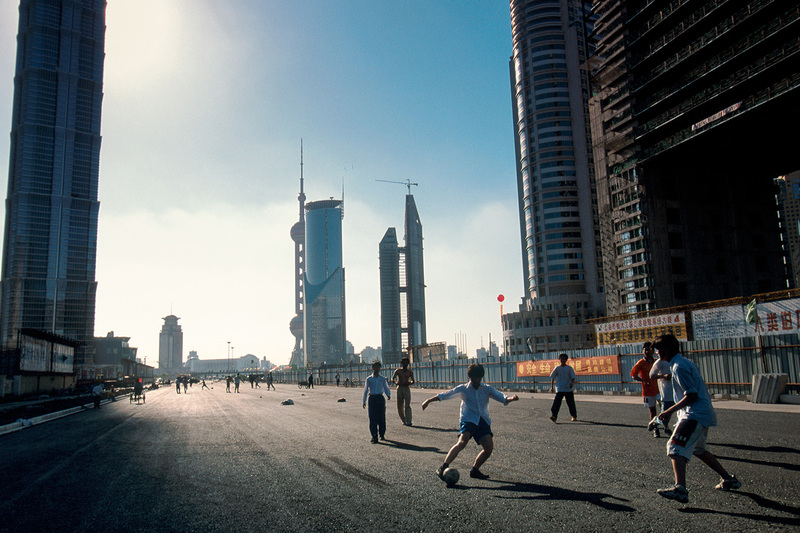 After Pudong was established as a special economic zone in 1993, construction sky-rocketed. Here it is 17 years later on a night in 2010. 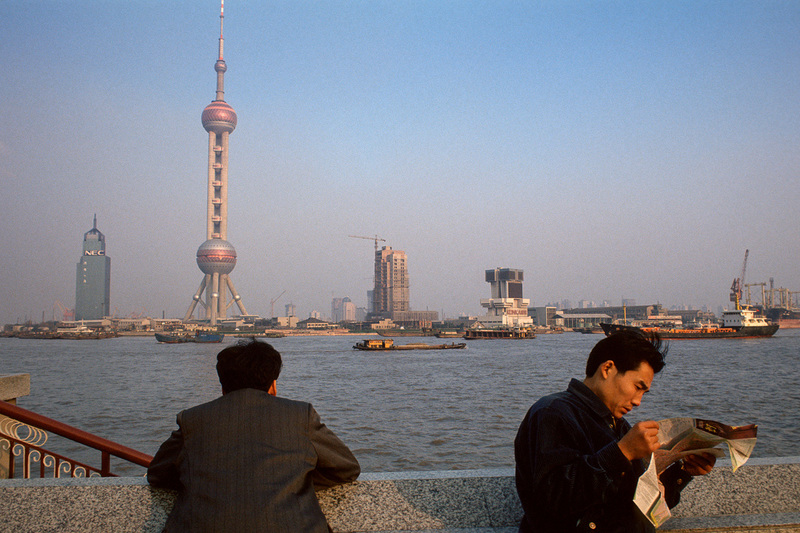 View of the Pudong New Area in 1994 seen from Puxi Bund, across the Huangpu River. 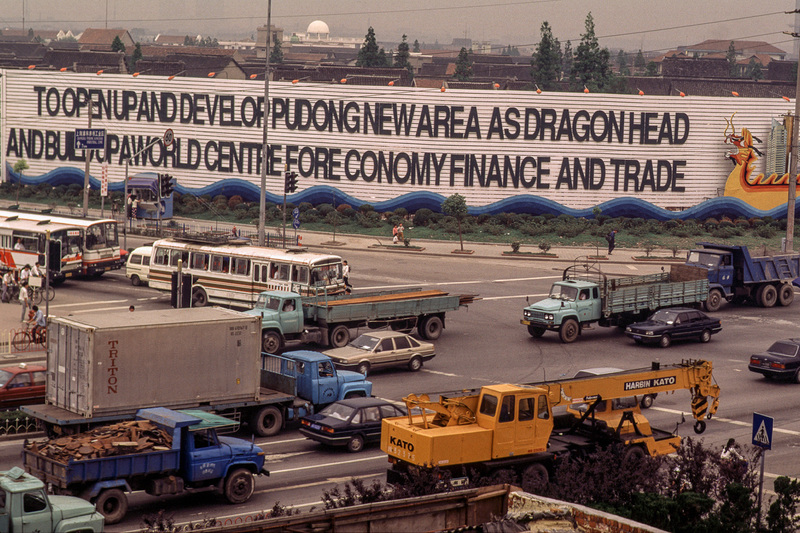 Government propaganda in Pudong near Lujiazui, 1996. 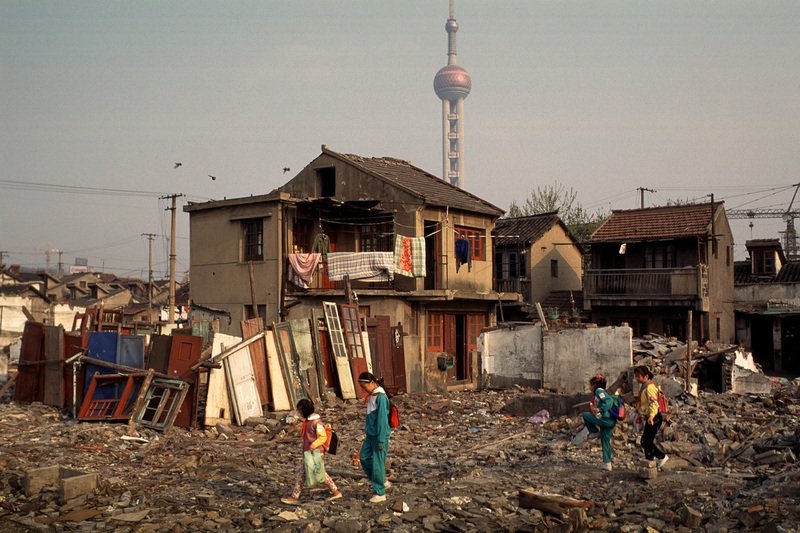 On their way to school, children pass through the rubble of demolished homes in their neighborhood in Lujiazui, 1996. 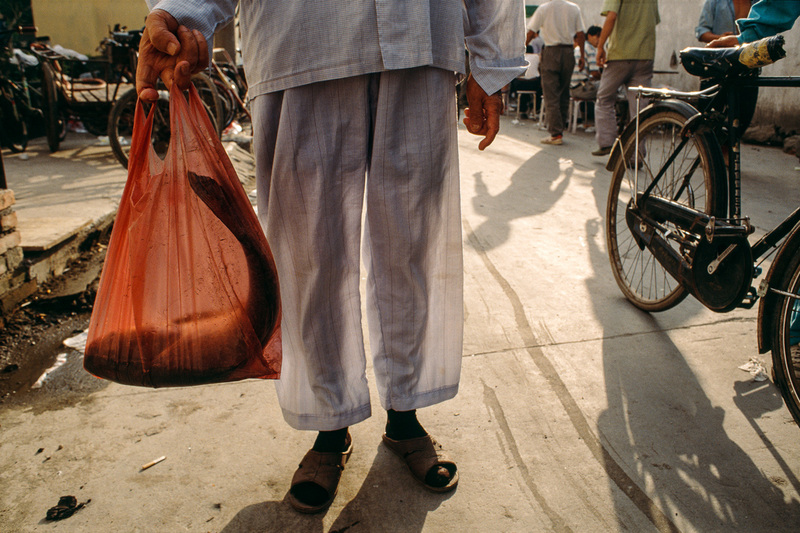 Dressed in his pajamas, a man leaves an open air market in Lujiazui with a fresh fish, 1997. 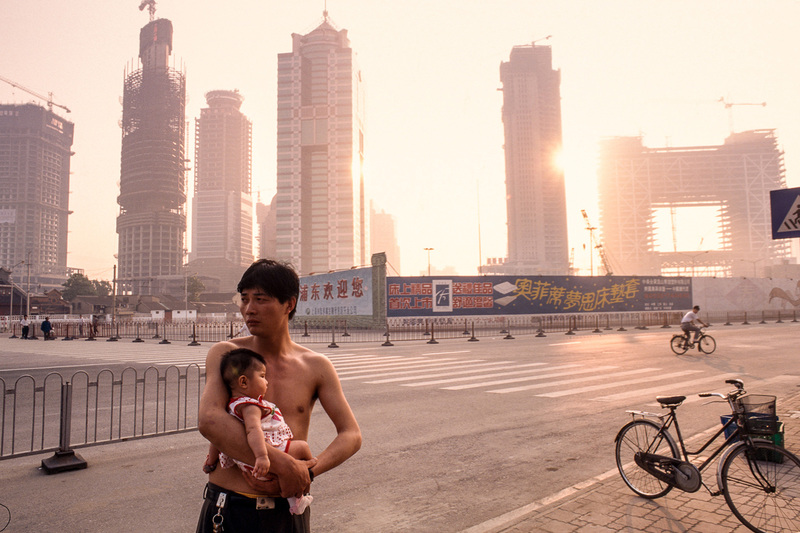 Outside his living quarters in Lujiazui, a construction worker from China’s countryside holds his child, 1996. 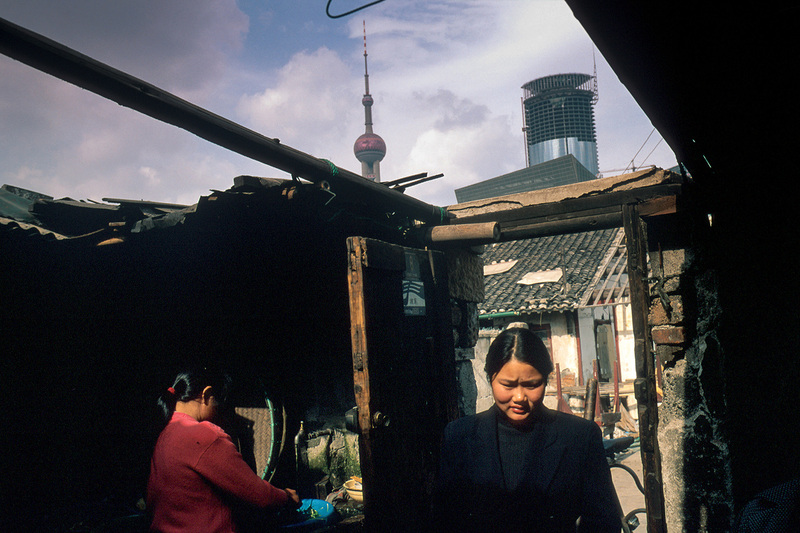 Homes vacated by residents to make way for construction projects were occupied by people from the countryside who came to Pudong to cater to the needs of construction workers, 1996. 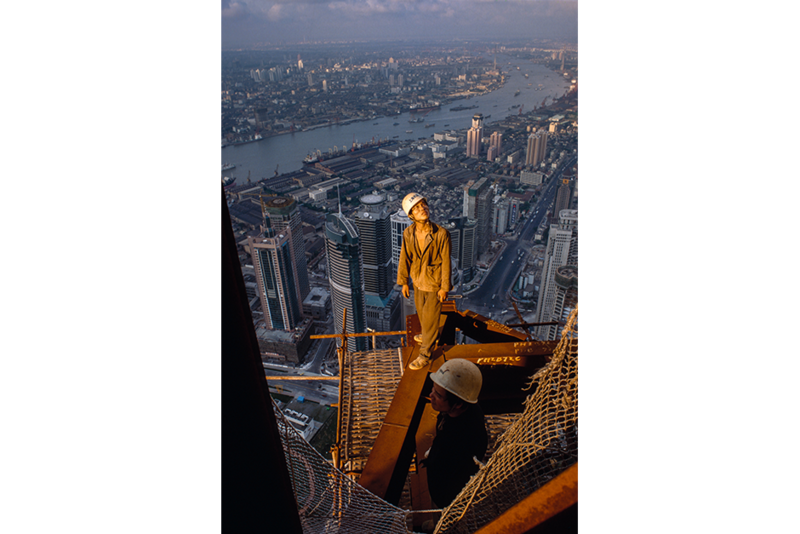 Steel use climbed as construction projects became more ambitious in size and style, 1998. 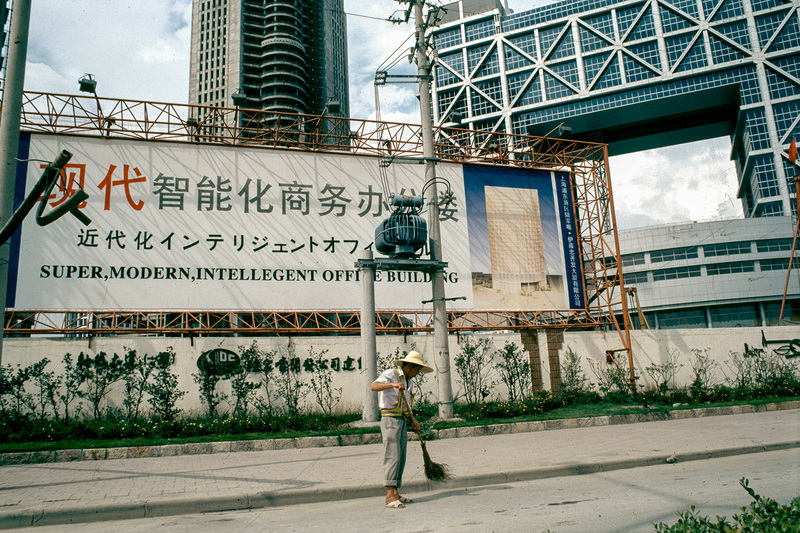 A street sweeper outside the Shanghai Stock Exchange building, 1997. Preparing to vacate her home, an elderly resident burns discarded personal items, 1997. 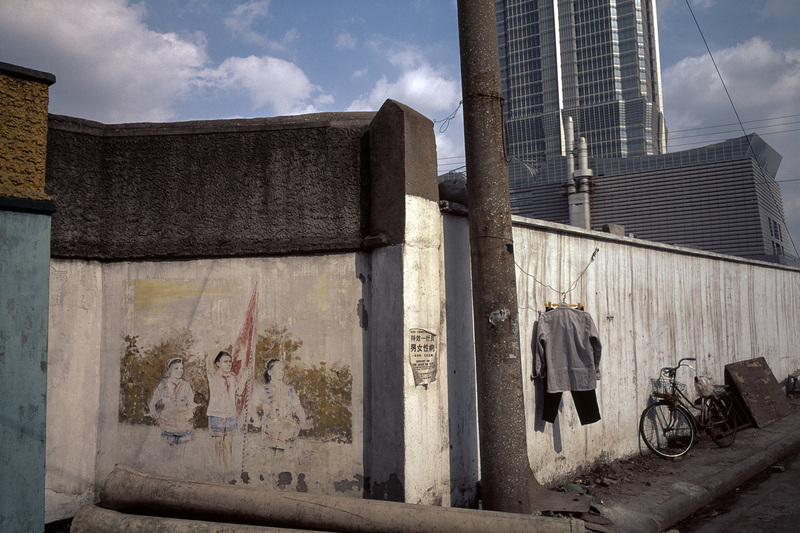 Outside the entry gate to a school in Lujiazui, 1996. 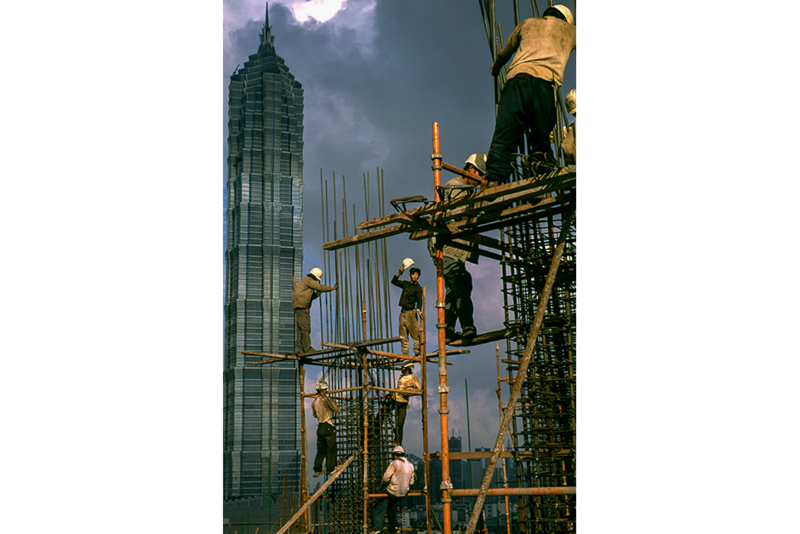 A village of construction workers takes root near the base of the Jin Mao Tower soon after construction began, 1997. 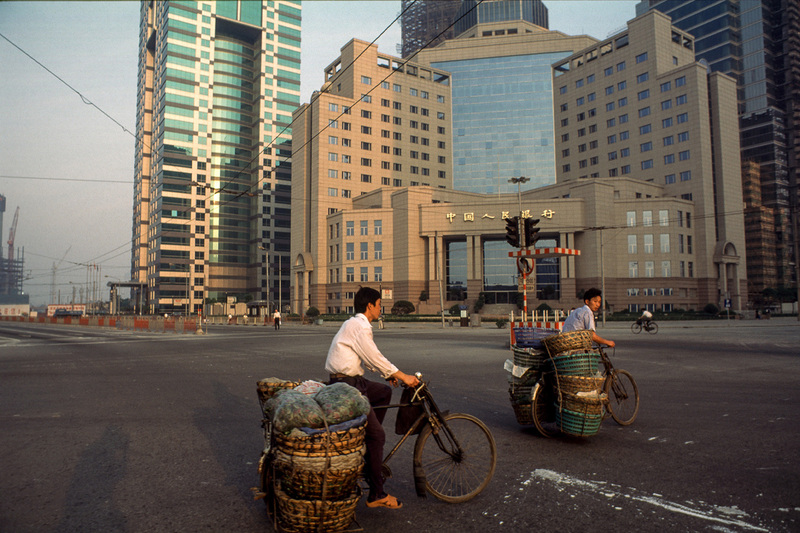 Farmers pedal their produce by bicycle past the yet unopened People’s Bank of China, 1996. 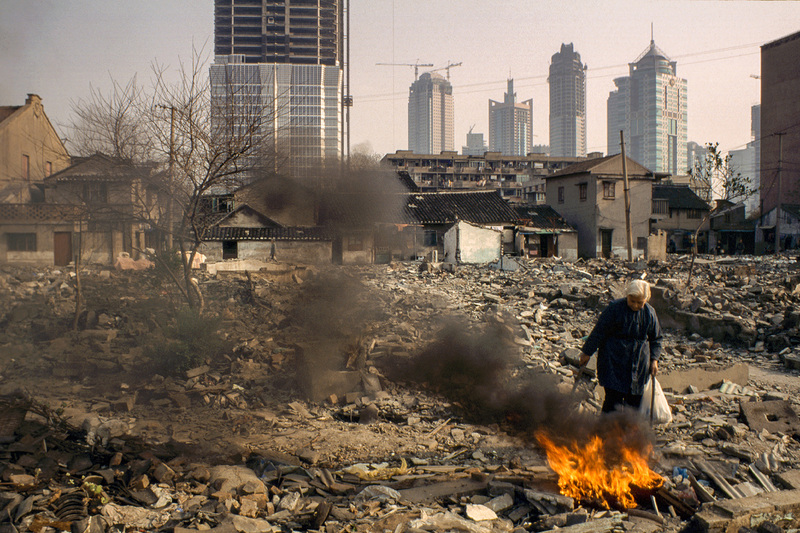 A razed neighborhood at the base of the Jin Mao Tower, 1997. 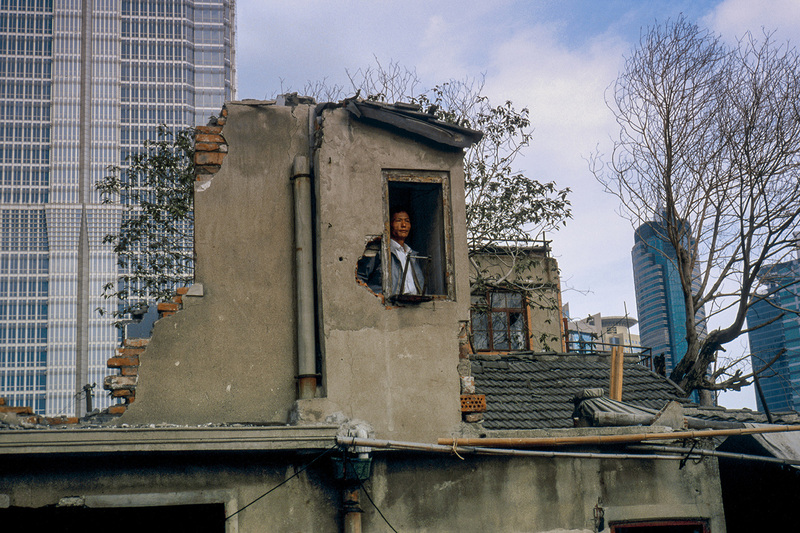 A resident refuses to leave his home at the base of the Jin Mao Tower, 1998. 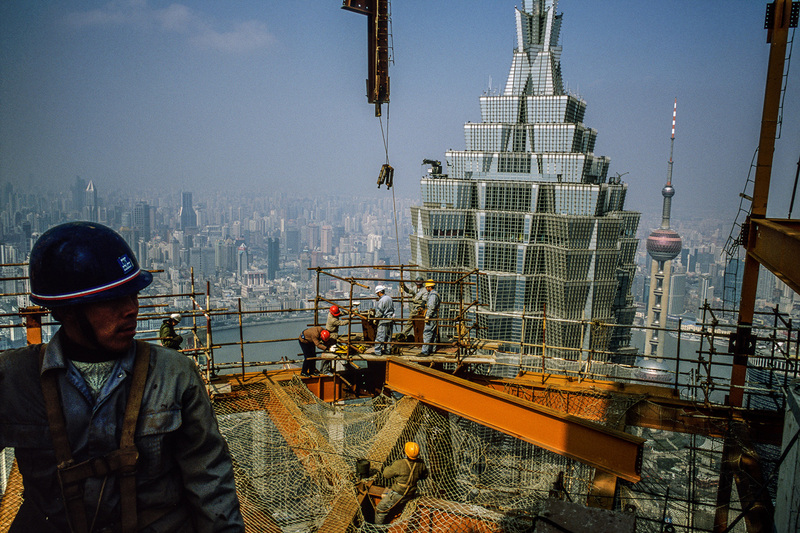 A former farmer from Zhejiang province erects scaffolding on the 87th floor of the Jin Mao Tower in the location now occupied by Cloud 9 lounge, 1997. 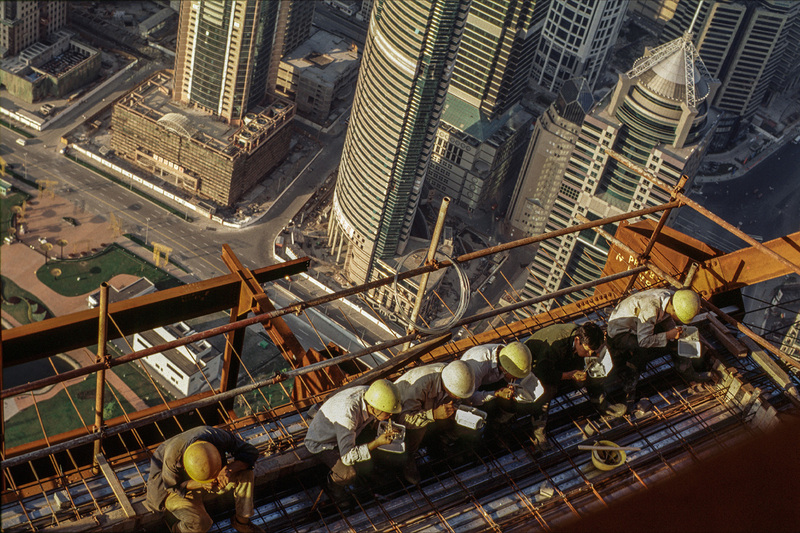 Construction workers take a break to eat boxed dinners high up on Jin Mao Tower, overlooking central Lujiazui, 1997. 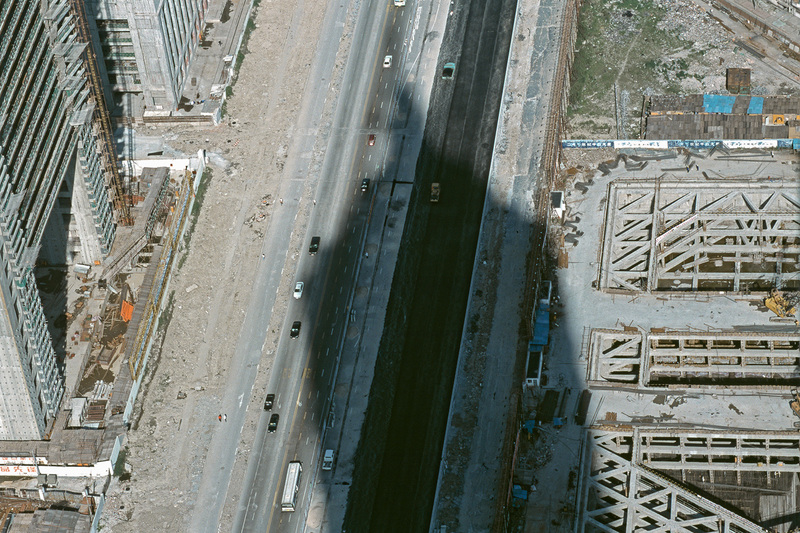 The shadow of the Jin Mao Tower falls across Century Boulevard and other construction sites in Lujiazui, 1999. Fresh asphalt on Century Boulevard makes an ideal spot for an after-school football match, 1998. 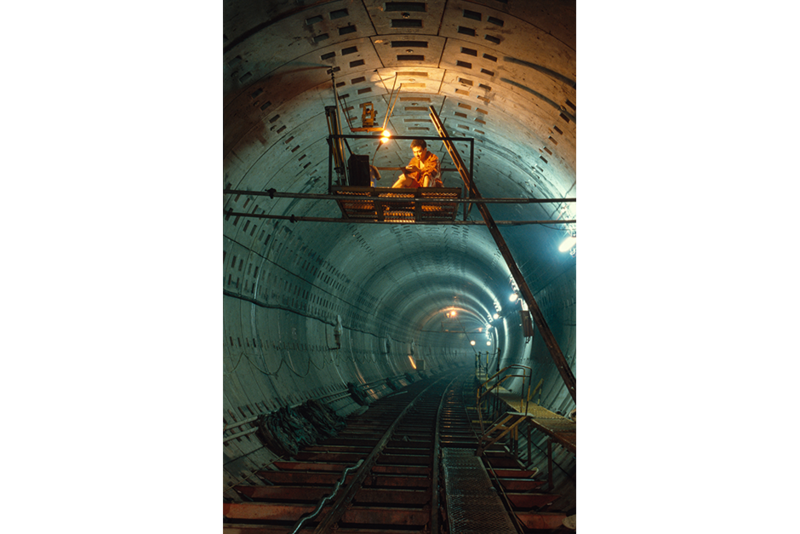 Construction of the second Yan’an tunnel in Lujiazui under the Huangpu River to connect Pudong with Puxi, 1998. Most of the men installing reinforcing steel on the Super Brand Mall were from the same village near Jinhua, Zhejiang province, 2000. 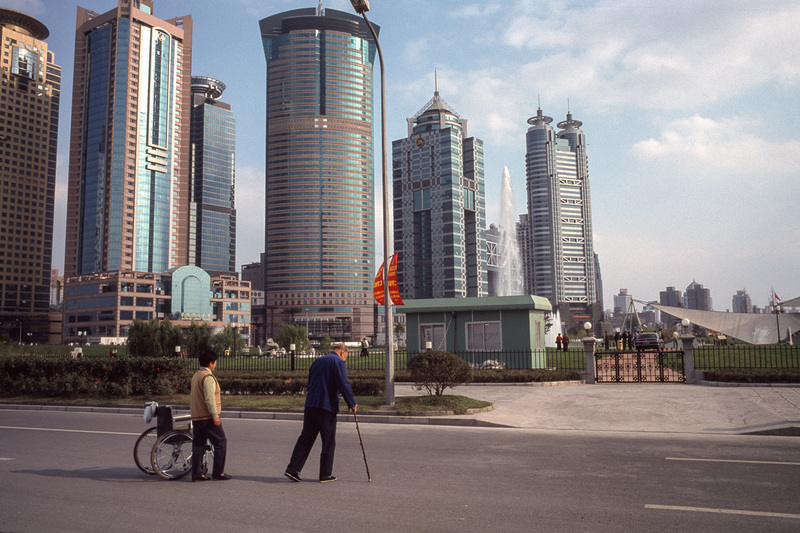 Two elderly people cross Yincheng Road to the Central Green, 2003. 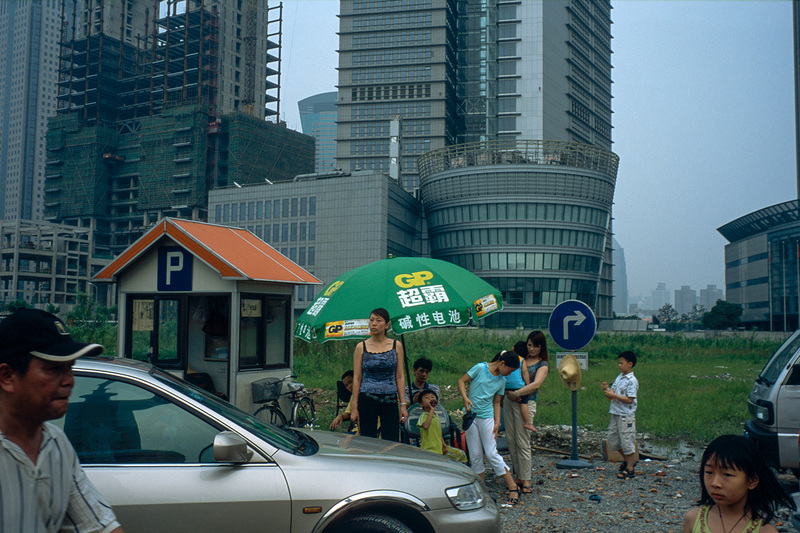 A building site in Lujiazui becomes an impromptu parking lot when construction there stalled, 2003. 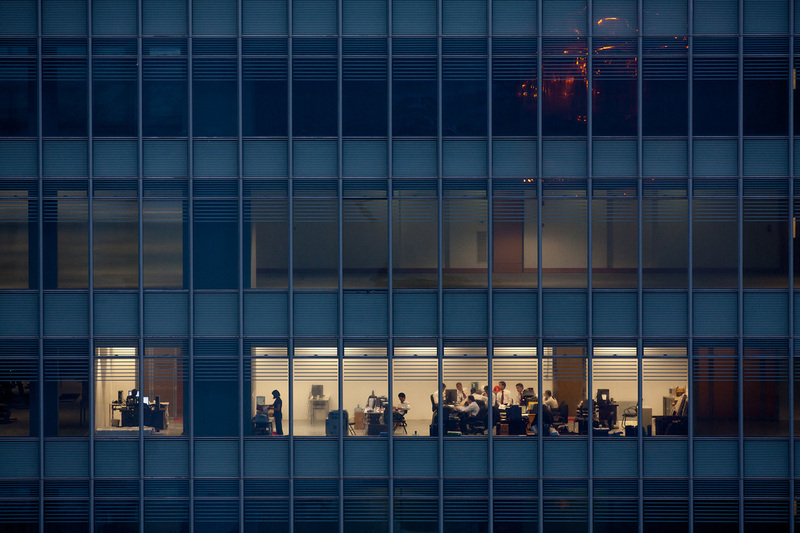 Office workers, perhaps the leasing department for the vacant building, are the only occupants in a newly constructed tower in Lujiazhui, 2010. 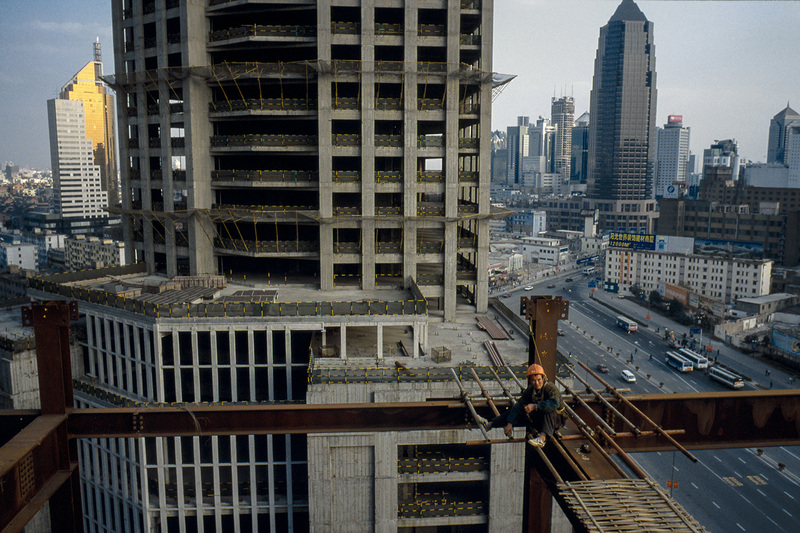 Steel workers from Sichuan set beams on the 88th floor of the Shanghai World Financial Center superstructure under construction in Lujiazui, 2007. 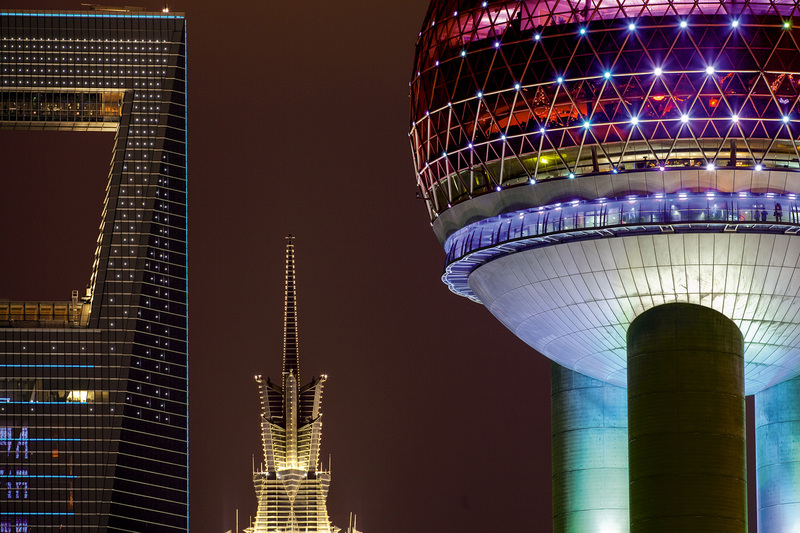 Three generations of architecture—the oldest, the Oriental Pearl Radio & TV Tower, right; the Jin Mao Tower, center; and the Shanghai World Financial Center—have become signature buildings in Shanghai’s skyline, 2010. China’s economy is still growing. But its ascent is nothing like the period of double-digit growth during the first decade of this century. 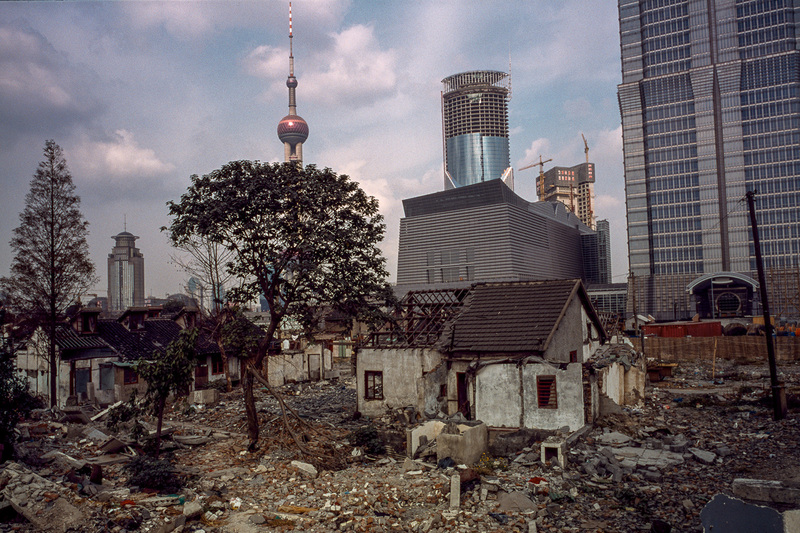 In the early aughts when the economy was soaring, Shanghai was the place that probably best embodied its rocket-like climb and outsized ambitions. 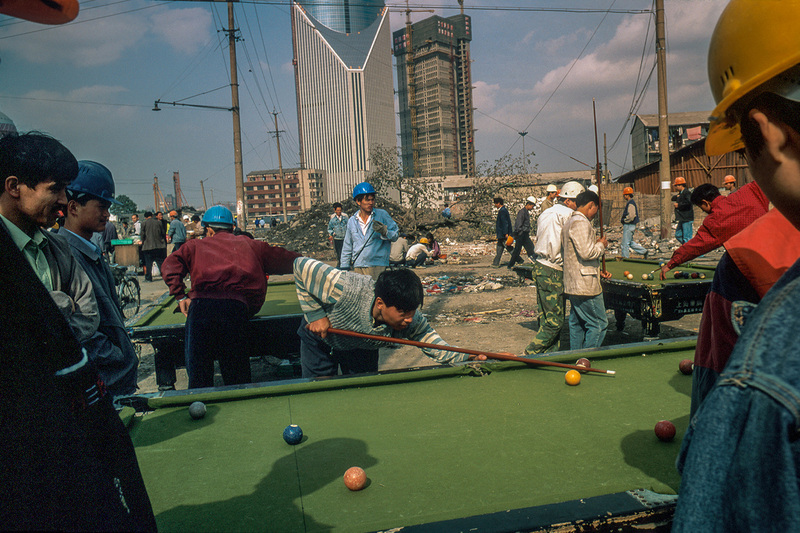 Fritz Hoffmann, an independent photojournalist, was based in Shanghai from 1995 to 2008. He was the first foreign photojournalist to be accredited to live outside of Beijing since 1949.